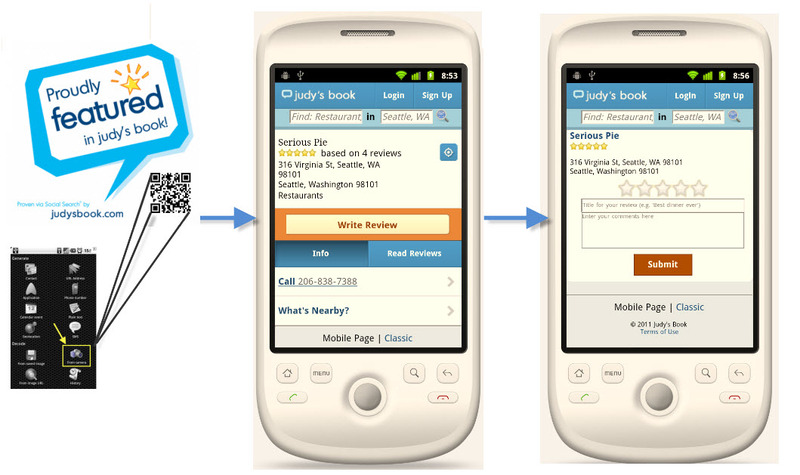 Judy’s Book’s new mobile site draws more users into content creationRecommending your favorite places just got easier with Judy’s Book new mobile site and QR code window decals.The mobile site combined with the QR decals allows users to write a review in less than 1 minute and gives businesses a way to generate far more reviews than previously possible. Historically, only a very small percentage of users on social media sites have participated in content creation. Scan the QR code to navigate to the listings detail page. From the place details page click the write review button. Write your review and submit. For more information visit Judy’s Book on the web or through your mobile device. Businesses can get get a unique QR decal for their location and find more information at www.judysbook.com/Biz. For Press inquires e-mail press@judysbookteam.com. This entry was posted in Judysbook on September 6, 2011 by judysbookblog.